INTRODUCTION: Narrow band imaging (NBI) is a new imaging technique developed to improve the diagnostic accuracy of head and neck cancers by depiction of tumor-specific neo-angiogenesis. The purpose of this study was to assess the value of NBI in the diagnosis of laryngeal lesions. AIM: To assess the sensitivity and specificity of combined white light endoscopy (WLE) and NBI compared with WLE alone in the diagnosis of laryngeal lesions. SETTINGS AND DESIGN: Prospective study. MATERIALS AND METHODS: Thirty consecutive patients with various laryngeal lesions scheduled for microlaryngoscopic evaluation underwent WLE followed by NBI. Endoscopic NBI findings were classified into five types (I–V) according to the intraepithelial papillary capillary loop features. Types I–IV are considered benign, whereas type V is considered malignant. The observations were compared with histopathology. STATISTICAL ANALYSIS: Sensitivity, specificity, and positive and negative predictive values for the diagnosis of malignancy (i.e., invasive carcinoma and carcinoma in situ) by means of NBI with WLE were calculated. RESULTS: The sensitivity of WLE combined with NBI (100%) was higher than WLE alone (82.6%) in detecting laryngeal cancers. NBI helped in identifying four malignant lesions missed by WLE alone. Two children with respiratory papillomatosis also demonstrated type V pattern, a potential pitfall, leading to an overall positive predictive value of 92% and a negative predictive value of 100%. CONCLUSION: Combining NBI with WLE increases the sensitivity of detection of laryngeal cancer and its precursor lesions. NBI is also useful in some benign lesions as well as in post-radiotherapy patients. The visualization of laryngeal and hypopharyngeal lesions has been significantly enhanced with the advent of technological advancements in endoscopes, lighting systems, and camera systems. Accurate recognition of the exact pathology by non-invasive means, however, has remained a considerable challenge. The detection of lesions that are small, recurrent, or in post-treatment settings, and the differentiation of benign versus malignant lesions in certain situations present formidable challenges to clinicians. The characteristic patterns of changes in morphology of intraepithelial papillary capillary loop (IPCL) in the superficial mucosa of normal, inflammatory, precancerous, and cancerous tissues have been studied extensively under NBI. IPCL changes signifying malignancy are dilatation, meandering, change in caliber, and non-uniformity (variation in shape) of the vessels., Through this study, we have evaluated the diagnostic potential of NBI compared with WLE in identifying laryngeal lesions. NBI equipment included a xenon light source with integrated NBI filter, a high-definition videoendoscope with chip-on-the-tip technology, and a video system unit. Switching between the conventional mode (white light) and NBI mode is achieved by pressing a button on the endoscope or at the unit less than a second during the procedure. In this study, we used Olympus Medical Systems (Tokyo, Japan) with their standard settings. Type I lesions correspond to thin, oblique, and arborescent vessels without any IPCL. Type II lesions show enlarged, oblique, and arborescent vessels without any IPCL. In type III lesions, vessels are obscured or seen indistinctly by white mucosa. In type IV lesions, IPCL can be recognized as regular, small, and dark brown spots. In type V lesions, IPCL appears solid or hollow, with a brownish, speckled pattern, and of various shapes (type Va), or as irregular, tortuous, line-like shapes (type Vb), or as brownish speckles or tortuous, line-like shapes with irregular distribution, scattered on tumor surface (type Vc). Thus, type I–IV lesions are considered benign and V lesions as malignant. Informed written consent was obtained from each patient before the procedure. All biopsies were performed after obtaining NBI images. The biopsy specimens were fixed in 10% formalin and submitted for histopathological examination. The pathologist was blinded to the results of WLE and NBI. The histopathologic results were analyzed retrospectively with NBI and WLE images. Sensitivity, specificity, and positive and negative predictive values for diagnosis of malignancy [i.e., invasive carcinoma and carcinoma in situ (CIS)] were calculated separately for WLE and WLE with NBI. All the patients (n = 30) tolerated the procedure of endoscopy well. 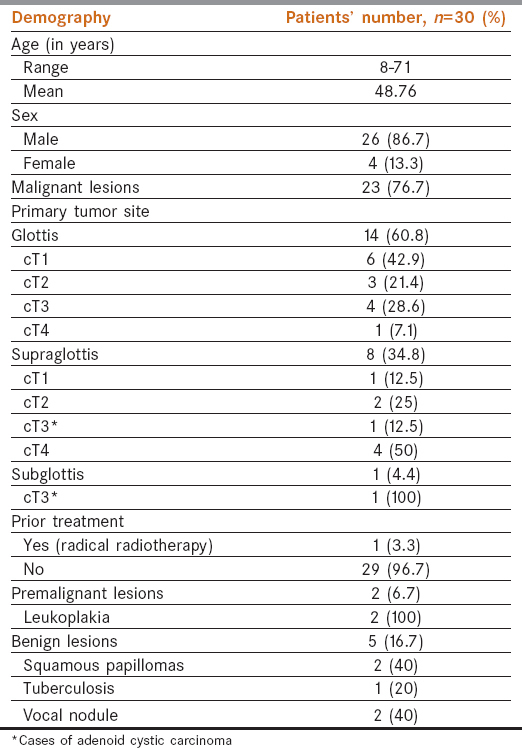 The clinical characteristics of the patients are depicted in [Table 1]. The average time taken for complete procedure of endoscopy (both WLE + NBI) was 2–3 min. Histopathological examination revealed a malignant/pre-malignant lesion in 23 patients [19 cases of SCC; 2 cases of CIS, and 2 cases of adenoid cystic carcinoma (ACC)]. 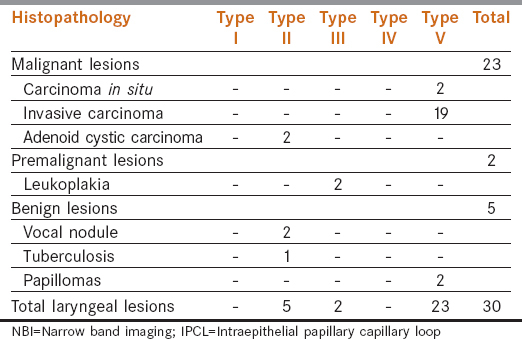 Of these, all the 21 surface epithelial lesions were correctly classified as malignant by NBI only on the basis of abnormal intraepithelial microvascular changes [Table 2]. In contrast, WLE was able to pick up only 17 (of 21) cases. NBI, through its enhanced optics and contrast, picked up these four early malignant lesions which were barely suspicious for malignancy under WLE [Figure 1]. Both the cases of ACC did not reveal any abnormal IPCL on NBI-only view. However, these could be visualized as submucosal growth by WLE. Thus, combining NBI with WLE increased the diagnostic sensitivity to 100% for identification of malignant lesions [Table 3]. Among benign lesions, vocal nodule (n = 2) and tuberculosis (n = 1) displayed type II pattern. NBI was particularly helpful in the latter case, in which the patient had a slough-like growth over true vocal cords with WLE mimicking malignancy. NBI findings also helped in a patient who had previously undergone radiotherapy for stage Ia carcinoma of the left true vocal cord [Figure 2]. On WLE, there was a lesion at the same site, suspicious for recurrence but on NBI type III pattern was noted and the biopsy revealed mild to moderate dysplasia without any invasive malignancy. However, respiratory papilloma cases (n = 2) were falsely positive for malignancy in NBI with type V pattern [Figure 3]. Sensitivity, specificity, and positive predictive value and negative predictive values for diagnosis of malignancy by means of combining WLE + NBI images calculated from these results were 100%, 71.43%, 92%, and 100%, respectively [Table 4]. NBI findings are particularly useful in many cases for guiding the site of biopsies [Figure 4]. Chang et al. advised that office-based NBI-guided flexible laryngoscopic biopsy is an effective and efficient technique with high diagnostic accuracy, and overall sensitivity and specificity were 97.2% and 100%, respectively, with a diagnostic accuracy of 98.9%. Accuracy in their study was not affected by tumor size, location, learning curves, or previous head and neck cancer history, indicating that NBI can aid in targeting specific site biopsies. In our study too, none of the patients needed a second biopsy for confirmation of malignancy. We believe that NBI is also beneficial in a variety of benign lesions by their better recognition in NBI mode and hence, some benign lesions can readily be detected in a very early stage. NBI allows a better differentiation between bamboo nodes and vocal fold cysts, early respiratory papilloma, venous ectasias, or small hemangiomas, thus helping in several therapeutic occasions such as intraoperative laser vaporization of early respiratory papilloma and microcoagulation of ectatic veins or small hemangiomas., Dippold et al. found that NBI in combination with WLE improves the detection rate of benign lesions of larynx, especially of vocal fold cysts. Although NBI has many advantages, a few hardships may be encountered. To assess the vessels properly, the videoendoscope is brought close to the lesion, that is, behind the epiglottis deep into the larynx, which at times is difficult in patients with strong gag reflex., In such patients, NBI can be performed after giving regional blocks or under general anesthesia. The cost of the equipment and lack of assessing the vertical extent of the lesion are other significant disadvantages of NBI. Occasionally, false-negative and false-positive results do occur with NBI. Severe hyperkeratosis may cover a subjacent cancerous lesion, warranting the need for thorough examination of the surrounding areas for any vascular atypias., Similarly, capillary patterns may not be appreciable in submucosal lesions. We had false-negative reports in two patients with ACC, which clinically appeared as a submucosal bulge, masking the IPCL patterns. The sample size is too small to accurately determine the diagnostic accuracy of NBI for diagnosis of laryngeal lesions. Because our center is burdened with malignancy patients, only a few benign cases were scheduled for microlaryngoscopy and hence less number of benign cases was included in the study. Ours is the first study on the use of NBI in diagnosis of laryngeal lesions in Indian patients. Combining NBI with WLE increases the sensitivity of identifying laryngeal cancer and its precursor lesions. NBI helps in detection and delineation of suspicious malignant lesions, determination of their horizontal extension, and field cancerization. NBI is also useful in a variety of benign lesions and in post-radiotherapy patients. Despite being a clinically useful tool than WLE in various laryngeal lesions, the possibility of false-positive and false-negative results, though rare, should be kept in mind. Cost-effectiveness requires to be thoroughly evaluated by larger studies taking financial aspects into consideration, especially in developing countries. Cosway B, Drinnan M, Paleri V. Narrow band imaging for the diagnosis of head and neck squamous cell carcinoma: A systematic review. Head Neck 2016;38(Suppl 1):E2358-67. Kraft M, Fostiropoulos K, Gürtler N, Arnoux A, Davaris N, Arens C. Value of narrow band imaging in the early diagnosis of laryngeal cancer. Head Neck 2016;38:15-20. Uedo N, Ishihara R, Iishi H, Yamamoto S, Yamamoto S, Yamada T, et al. A new method of diagnosing gastric intestinal metaplasia: Narrow-band imaging with magnifying endoscopy. Endoscopy 2006;38:819-24. Ni XG, He S, Xu ZG, Gao L, Lu N, Yuan Z, et al. Endoscopic diagnosis of laryngeal cancer and precancerous lesions by narrow band imaging. J Laryngol Otol 2011;125:288-96. Watanabe A, Taniguchi M, Tsujie H, Hosokawa M, Fujita M, Sasaki S. The value of narrow band imaging for early detection of laryngeal cancer. Eur Arch Otorhinolaryngol 2009;266:1017-23. Piazza C, Cocco D, De Benedetto L, Del Bon F, Nicolai P, Peretti G. Narrow band imaging and high definition television in the assessment of laryngeal cancer: A prospective study on 279 patients. Eur Arch Otorhinolaryngol 2010;267:409-14. Marioni G, Marchese-Ragona R, Carteri G, Marchese F, StaYeri A. Current opinion in diagnosis and treatment of laryngeal carcinoma. Cancer Treat Rev 2006;32:504-15. Piazza C, Dessouky O, Peretti G, Cocco D, De Benedetto L, Nicolai P. Narrow-band imaging: A new tool for evaluation of head and neck squamous cell carcinomas. Review of the literature. Acta Otorhinolaryngol Ital 2008;28:49-54. Bertino G, Cacciola S, Fernandes WB Jr, Fernandes CM, Occhini A, Tinelli C, et al. Effectiveness of narrow band imaging in the detection of premalignant and malignant lesions of the larynx: Validation of a new endoscopic clinical classification. Head Neck 2015;37:215-22. Zabrodsky M, Lukes P, Lukesova E, Boucek J, Plzak J. The role of narrow band imaging in the detection of recurrent laryngeal and hypopharyngeal cancer after curative radiotherapy. Biomed Res Int 2014;2014:175398. Staníková L, Kučová H, Walderová R, Zeleník K, Šatanková J, Komínek P. Value of narrow band imaging endoscopy in detection of early laryngeal squamous cell carcinoma. Klin Onkol 2015;28:116-20. Chang C, Lin WN, Hsin LJ, Lee LA, Lin CY, Li HY, et al. Reliability of office-based narrow-band imaging-guided flexible laryngoscopic tissue samplings. Laryngoscope 2016;126:2764-9. Wu JH, Luo XY. Application of narrow band imaging in the detection of premalignant and malignant lesions of the larynx. Zhonghua Er Bi Yan Hou Tou Jing Wai Ke Za Zhi 2017;52:900-4. Ni XG, Wang GQ. The role of narrow band imaging in head and neck cancers. Curr Oncol Rep 2016;18:10. Piazza C, Del Bon F, Peretti G, Nicolai P. Narrow band imaging in endoscopic evaluation of the larynx. Curr Opin Otolaryngol Head Neck Surg 2012;20:472-6. Tjon Pian Gi RE, Halmos GB, van Hemel BM, van den Heuvel ER, van der Laan BF, Plaat BE, et al. Narrow band imaging is a new technique in visualization of recurrent respiratory papillomatosis. Laryngoscope 2012;122:1826-30. Imaizumi M, Okano W, Tada Y, Omori K. Surgical treatment of laryngeal papillomatosis using narrow band imaging. Otolaryngol Head Neck Surg 2012;147:522-4. Dippold S, Nusseck M, Richter B, Echternach M. The use of narrow band imaging for the detection of benign lesions of the larynx. Eur Arch Otorhinolaryngol 2017;274:919-23. Muto M, Minashi K, Yano T, Saito Y, Oda I, Nonaka S, et al. Early detection of superficial squamous cell carcinoma in the head and neck region and esophagus by narrow band imaging: A multicenter randomized controlled trial. J Clin Oncol 2010;28:1566-72. Lin YC, Watanabe A, Chen WC, Lee KF, Lee IL, Wang WH. Narrowband imaging for early detection of malignant tumors and radiation effect after treatment of head and neck cancer. Arch Otolaryngol Head Neck Surg 2010;136:234-9. Piazza C, Cocco D, De Benedetto L, Del Bon F, Nicolai P, Peretti G. Role of narrow-band imaging and high-definition television in the surveillance of head and neck squamous cell cancer after chemo- and/or radiotherapy. Eur Arch Otorhinolaryngol 2010;267:1423-8.